These cords work with the Addi Lace Click kit. 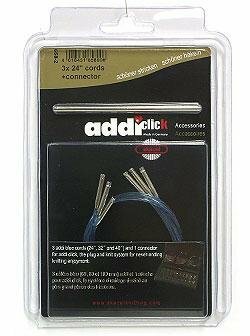 Each Addi Lace Click kit features 8 pairs of addi Lace tips in approximate US sizes: 4, 5, 6, 7, 8, 9, 10, and 11, along with 5 blue addi cords which create 16, 20, 24, 32, and 40 needles (approximate lengths), 1 Click connector, and a gold addi heart pin. The Lace Click tips were created to be shorter in length (3.5), to allow for both 16 and 20 applications. While the 24, 32, and 40 cords from both the regular and lace sets are fully compatible with any style of tip, the new 16 and 20 cords are not compatible with the regular Turbo tips. Additional packs of cords will be introduced at a later date. Knitter's Pride Cords Needles and Addi SOS Click Cords Needles are both similar needles: 32" (80cm), interchangeable cords, and multiple sizes or sets US size.